HAS KARNATAKA GOT A STABLE GOVERNMENT AT LAST ? The news of the death of Shankaracharya Jayendra Saraswati did not surprise me as for six years at least, as I personally know, his health had been bad, his diabetes was not under control. The three women who had conspired against him, Sonia Gandhi, Jayalalitha and Shashikala each suffered in her own way. Jayalalitha won elections after being defeated for one term, became the Chief minister but suffered from bad health and died a mysterious death. Shashikala is in jail and her claims of leadership is not accepted in AIADMK. It makes her a weak politician. Sonia Gandhi, now suffering from some disease has retired from active politics, has handed over the presidentship of the Congress Party to her son, in the usual familiar Nehru way---dynastic succession. Sonia’s role in the sinister plot to arrest Shankaracharya Kanchi has been mentioned by the former president of India Sri Pranab Mukherjee (See appendix I). On 3rd March came the news of the death of Mouni Baba, three days after the mahasamadhi of Shankaracharya Jayendra Saraswati on the last day of February. Jayendra Saraswati, born in 1935, was 82 years when he took samadhi. In the case of Mouni Baba we never knew his age as no one knew it and it was guessed that he was ninety three years old when he took samadhi though some newspapers said that he was 108 years old then. An explanation of the horoscope is being deferred as both are outstanding individuals. The horoscopes are of two persons chosen by the US population after stringent examination and intense media scrutiny. (a) LUCK- Ninth house and Ninth Lord defines luck which translates the electoral competitiveness of 6th house merging it in the combined efforts of the other eleven houses into the result. The luckier of the two should get the Presidentship. (b) Navamsha- Navamsha is examined to ascertain the actual worth of an individual. Study it from “Swamsh” as Lagna (Swamsh is the house where AK planet is placed in the Navamsha). (c) Dasha and Transit- These two provide dynamism to the horoscope and bring it up-to-date. Dasha has the key to open the box where promises of the horoscopes are locked and transit has the responsibility to deliver the results to the jatak. (d) Retrogression of Mercury on 6th November, 2012- A planet getting retrograde or direct at the time of event influences the outcome of the event. Retrogression of Mercury just at the time of declaration of results may influence the result. (a) Mitt Romney- In this Taurus Ascendant horoscope the Ascendant Lord (Venus) is placed in 9th house. Romney is a lucky person. There is small catch, Ninth Lord Saturn is in 3rd house and is aspecting Venus in 9th house, but the 3rd house from Ascendant is 8th from 8th house. This Ninth Lord Saturn is aspected by Eighth Lord Jupiter. It gets further aggravated when Ninth Lord from Moon is in degree-conjunction (Samagam) with Jupiter the Eighth Lord. These two- Eighth Lord and the Third Lord in degree-conjunction aspect the Ascendant also. The lucky sheen gets dulled. This 8th house/9th house combination also raises question of religion. Religion followed by Romney is Mormonism – a sect promoted by Later Day Saint Movement (LDS). Mormons are a sect that permits polygamy and they are fiercely loyal to one another. Mormons have their admirers and detractors. The luck of Romney has a dent of a religious sect. (b) Obama- Obama’s Ninth Lord is Mercury. It is aspecting the Ascendant and Ascendant Lord Saturn in the Ascendant. Saturn is the Ninth Lord from the Moon. Two Ninth Lords Mercury and Saturn are in mutual aspect- we know Obama is very lucky. Now see the 8th house and Lord infringement on 9th house and Lord. Ninth Lord Mercury is conjunct Eighth Lord Sun and, from Moon, Ninth Lord Saturn is conjunct Eighth Lord Jupiter. Obama has his share of religious bigotry- he has a Muslim middle name- Barack Hussain Obama. Obama not only has to repeatedly assert that he is a Christian but he also has to assure the public that he is a US born Christian. The two future Presidential nominees have their 9th house and Ninth Lord ‘smudged by 8th house and Eighth Lord’. One is Mormon and other has a Kenyan father, a Muslim stepfather and Hussain as a middle name. The religious deviation is in both the cases. On luck both appears to be equal. It is as Media says “too close to call”. In Swamsh we would examine the 4th house (Masses and Chair), 10th house (Karma and Authority) and the Jaimini Rajyogas. (a) Romney- His Sun in Ascendant has aspect of Ninth Lord Saturn from 4th house, the Tenth Lord Jupiter aspect Fourth Lord Mercury in 11th house. Fourth Lord Mercury is in Rahu/Ketu axis. Jupiter the Tenth Lord is aspected by exalted Sixth Lord from 8th house- this puts small damper. Romney has three Rajyogas viz. Atma Karak-Putra Karak, Amatya Karak-Dara Karak and Fifth Lord-Dara Karak. (b) Obama- Fourth Lord Jupiter in 4th house aspects the Tenth Lord Mercury exalted in 10th house. Fourth Lord aspected by Saturn the Tenth Lord from Moon, and Mars Fifth Lord from Ascendant in 9th house from Moon. The Masses and Chair has the influence of the Tenth Lords from Ascendant and Moon respectively. Mars the Fifth Lord placed in 9th house from Moon also aspects the 4th house. 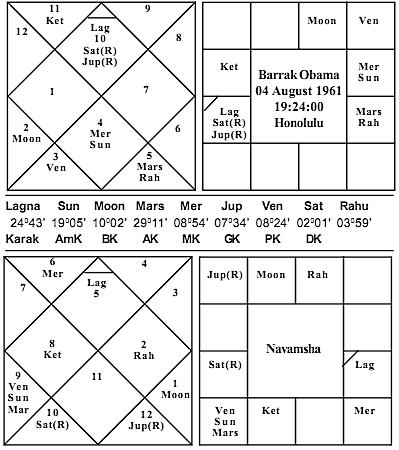 Obama has three Rajyoga producing planets in the Ascendant making it very strong. The Rajyogas are Amatya Karan-Fifth Lord, Atma Karak-Fifth Lord, total 5. In ‘Swamsh’ Obama edges ahead of Romney. Sun (Fourth Lord) is in 10th Gemini house conjunct Mercury(R) the Fifth Lord. This 10th house is the 4th house from the Romney’s Moon and interestingly Sun is now the Tenth Lord. The Sun-Mercury a conjunction of Fourth Lord and Fifth Lord generates a Rajyoga in 10th house. This Rajyoga is now unlocked by the dasha of MD Sun and AD Mercury and is ready for giving Romney the victory. But there is a slight snag– Sun the Mahadasha Lord is transiting in the Libra – the 6th house along with the Saturn the Tenth Lord. Saturn’s exaltation helps Sun, the Mahadasha Lord to have a ‘Neech Bhanga' Rajyoga. This is good for an electoral victory. Let us now examine the Eighth house and Lord causing sudden restrictions. Saturn in Natal chart is Tenth Lord retrograding in 3rd house (8th from 8th house) aspected by the Eighth Lord Jupiter. Sun is not entirely taint free as it is Tenth Lord from Moon conjunct Mercury the Eighth Lord again from Moon in the 4th house from Moon. Mercury the Eighth Lord from Moon is transiting in Scorpio, the 7th house of the ‘Padprapti’. Mercury is transiting over Jupiter the Eighth Lord. This is bad news for Romney. It becomes worse when one notices Rahu the Pratyantar Dasha Lord also transiting in Scorpio. Rahu’s transit over Natal Jupiter aggravates the bad transit of Mercury. Now to Chara Dasha, it is Leo/Gemini. Leo is 4th house rashi– good for the chair. Leo is weak as it has the aspect of Venus only. Gemini is weaker as there are no planets in the dual signs. The Dasha and Transit do not appear to hold much hope for Romney. Saturn is the Lagna Lord of Obama. Saturn is aspecting the 10th house. Ascendant is the 9th house from Moon also. Saturn is controlling the dashas as he is Mahadasha, Antardasha & Pratyantar Dasha Lord and is transiting in Libra in the 10th house. Saturn is exalted and conjunct Sun – ‘Digbali’ in the 10th house. Saturn aspects the 4th house of chair and 7th house of ‘Padaprapti’ from the house of honor and authority. This dasha and transit is better than the one enjoyed by Romney. Chara Dasha Capricorn/Libra – Capricorn has Saturn conjunct Jupiter and aspected by Moon, Mars and Rahu. Influence of five (5) planets on Capricorn makes it power packed and as Mars is AK and Saturn is DK- Rajyoga is also formed. Libra the 10th house rashi is again a char sign like Capricorn hence the aspect of Moon, Mars and Rahu are available here also. Ascendant and 10th house being activated, augur well for Obama. (a) Obama- Mercury is Sixth Lord and Ninth Lord of Obama placed in 7th house. It is transiting in 11th house along with Eleventh Lord Mars and Rahu. Eleventh house is 6th from 6th house and retrogression of Mercury is likely to give him gains (11th house) of competition (6th house). It may dent his luck. Mars the Fourth Lord in 11th house along with Ninth Lord Mercury in retrogression is going to aspect the 4th house from 10th house. Retrograde Mercury is likely to cause gains for Obama. (b) Romney- Romeny’s Mercury is Second Lord and Fifth Lord placed in 10th house with Sun (Fourth Lord) and Mars (Seventh Lord), perfect as these three houses define the presidential electoral fight. Mercury retrogrades on 6th November, 2012, in Scorpio the 7th house. Seventh house has Jupiter the Eighth Lord, Moon the Third Lord and Ketu placed in it. Mercury the Eighth Lord from Moon, transiting over the Jupiter the Eighth Lord from Ascendant is a cause for worry. Its retrogression would in all likelihood cause a loss. Adding to the woes is the Rahu, the Pratyantar Dasha Lord transiting over the Natal Jupiter. It is a poor transit as Jupiter’s 8th Lordship sends ominous signs. Romney’s problems multiply. Mercury is the Second Lord from Lagna and Eighth Lord from Moon. This induces lack of discretion in his talks. His remark at a fund raising party that 47% Americans, who do not pay income-tax live off the Government dole – in social security and health schemes. When Mercury retrogrades on 6th November, 2012 it is likely to extract the price of this indiscretion. Mercury retrogression on 6th November may cause a situation like the one seen in 2004 in Bush/Kerry contest. A recount, a mismatch- one winning the popular vote and other winning the Electoral College votes. An interesting scenario awaits us on 6th November, 2012. In conclusion one has no doubt that this is a very close race. Obama is likely to win it by just a hair breadth – His dasha and transit are superior to Romney and the retrogression of Mercury on 6th November is more helpful to Obama.